The company was not looking for a unified messaging system, video conferencing, color LCD phones with automatic VPN connections, etc. A basic PBX to support the phone needs of a small company was all that was needed. Proposals from a couple providers yielded total costs of a 10 hard phone + 10 soft phone system to be around $8,000 – $12,000 with an ongoing contract. This seemed a bit high considering the simplicity of the needs of the company. After some research and a lot of trial and error I was able to get the entire phone system deployed for less than $2,100 ($350 POE switch, 10 phones * $85, ~$900 analog card, used an old Windows box lying around). It took me about a week of full-time work to figure out how all the peices fit together and deploy the system. Although VOIP may seem a bit intimidating with all the lingo and plethora of options, it isn’t as hard or mysterious as it may seem at first. Hopefully this compilation of notes will help someone in a similar situation develop and deploy a VOIP Asterisk based solution. Enjoy. SIP Trunk = A digital alternative to POTS. I did not utilize a SIP Trunk in my setup, but from what I understand you basically grab a special card that then connects through your WAN to a remote SIP Trunk provider. 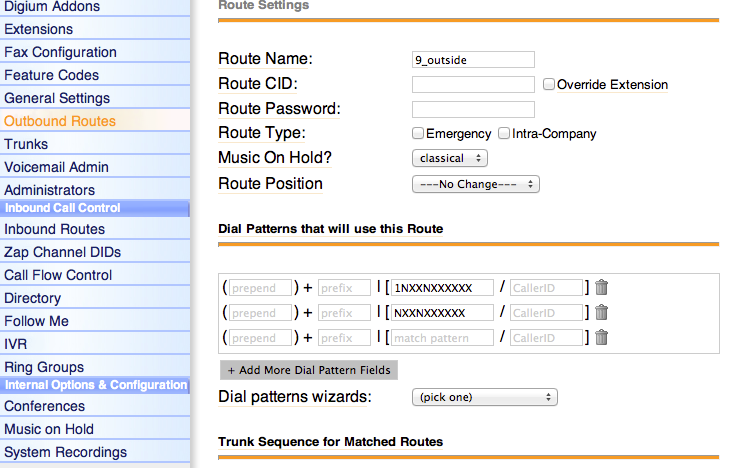 Essentially your phone lines are routed through your internet (similar to Skype). TFTP = Trivial File Transfer Protocol. The Polycoms (and many other phones) use TFTP to pull their application binary, configuration settings, and other information. 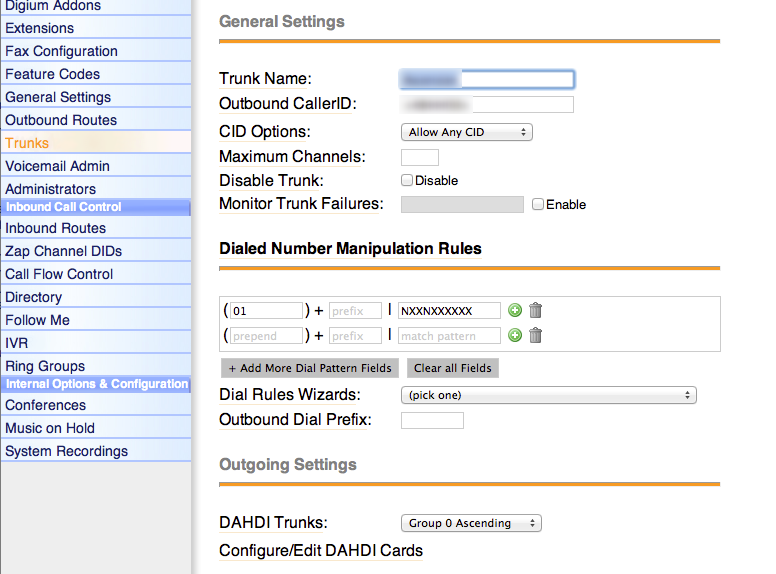 DAHDI = software that integrates with Digium (and other) analog and digital PCI hardware devices. This used to be called Zaptel. This software runs on the driver level of operating system (it isn’t a service like Asterisk). Essentially is bridges asterisk with POTS or SIP trunks. There a couple ways to handle Asterisk installation, and a couple GUIs to choose from. I settled on AsteriskNOW + FreePBX GUI. After downloading the image, burning it to disk, and booting from the disk on your asterisk box you still need to update to the latest versions of the software by running `yum update`. After running `yum update` you’ll have to update the FreePBX software. You can sort of do this through the FreePBX module interface, but there was an extra step involved that I couldn’t find my notes on. This message was caused because of an old Microsoft 2003 Business server that was still connected to the network. DHCP used to be handled by the server, but we switched DHCP to the SonicWall. Although DHCP was disabled on the MS server, it seemed to be sending out some sort of broadcast that caused the phones (and only the phones!) to report a duplicate IP. Eliminating the MS server was the only solution that worked (all services relating to DHCP had been turned off on the server. The Polycom devices support both FTP + TFTP configuration + boot loading. However, I was trying to simply the setup as much as possible and trivial FTP sounded a bit more simple. However, a TFTP server is not configured by default on an AsteriskNOW installation. To enable TFTP, first run `nano /etc/xinetd.d/tftp` from the command line and then change `disable = yes` to `disable = no`; save the file. Finally, run `service xinetd restart` from the command line. The TFTP server should be up and running. Note that the “tftp://” is important. In this specific instance I had a local DNS server running on a Mac Mini Server (Lion) that all clients were configured to hit before hitting the external DNS. I’m not sure if you needed an updated bootrom.ld and the specific 2345-12360-001.bootrom.ld; but it worked. At this point, with the DHCP options correctly set, for new phones you should be able to plug them into the network, run a scan using nmap, and add the phones via the end point manager GUI. Unplug & replug the Polycom phone in and it should pull the configuration from the TFTP server (the PBX box) set in the DHCP options and startup just fine. Although the phones claim to support loading the `000000000000-directory.xml` file into all phones; I could not get this to work even after factory resetting the phones. I grabbed the XML for the polycom directory by using this modified version of the printextensions module, copying the XML into the `000000000000-directory.xml` file, and then running this BASH script to copy the default to each of the phones custom directory.xml files. Do not use this with a production system as it will overwrite any users customizations. This is specific to Digium based cards. I didn’t know this until after purchasing the TDM800 with hardware echo cancellation, but after talking with an Digium customer support representative I learned that the algorithm used for echo cancelation is the same for the software based and hardware based echo cancellation. The CPU load on my installation hovers around 1%, I’m guessing for a < 20 person office environment the software based echo cancelation would of worked just fine (although I don’t have experiential evidence to support this). I was throughly impressed by the quality of Digium’s customer support. They answered non-hardware related questions, ssh’d into my machine to debug some issues, and there was a less than one minute wait time. 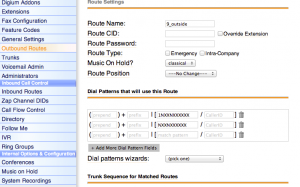 Configure your IVR, then go to Setup –> Inbound Routes. Choose “any DID / any CID”. At the bottom of the page switch “Destination” to IVR + desired auto attendant. I usually login to the Asterisk box as root. I configured the backups with my root SSH key, but the Asterisk backup process runs on the Asterisk user. Make sure that the SSH keys you hand off to FreePBX are readable by the asterisk process. Word of warning: I haven’t actually done this yet. These are the notes I’ve compiled, but I wasn’t able to get all this information together before the phone system was deployed. Most of the guides I was able to find were a bit out of date. When reading through those resources recall that Dahdi is the new Zaptel. There are two gain adjustments: inbound (rxgain) and outbound (txgain). In order to test the levels run the following command: dahdi_monitor 1 -vv. These levels can be calibrated against a 102 milliwat test number, I found one here: 670-234-0102. In this case the ‘db’ is assumed by asterisk. In chan_dahdi.conf the default value is 0.0. 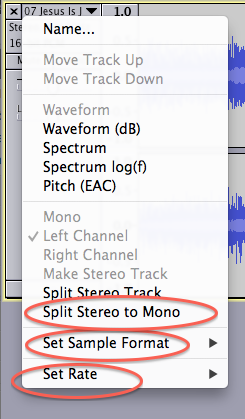 We encourage you to make small changes to any of these values as it can dramatically effect your audio. 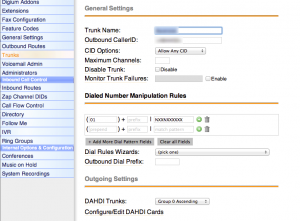 To add a invalid extension or timeout fallback to your IVR / autoattendant add two options in the IVR GUI: i & t (you specify i or t instead of a number) and then specify a action just like you would a normal IVR option. Caller ID is not consistent across carriers. Some carriers can disregard caller ID information altogether. I had trouble with the built-in Polycom phone restart script contained in the endpoint manager. I wrote a quick script to work with someone’s Polycom restart script as a workaround. I originally tested the system on an XP100 clone card, and I’m pretty sure that was the source of this issue, but this information was helpful in temporarily resolving that issue before I purchased the TDM800. You can export Asterisk compatible .wav files directly from Audacity without using any command line tools to post-process the audio. To reset a Polycom 321 phone, reboot the phone and hold 1 + 3 + 5 + 7. The default admin password on these devices is 456. Here is a list of links I found helpful while researching this stuff. Blink – Mac VOIP client. Paid. X-Lite – Mac + PC VOIP client. Free with ads or Paid.